Coburg fostering a new Lion! 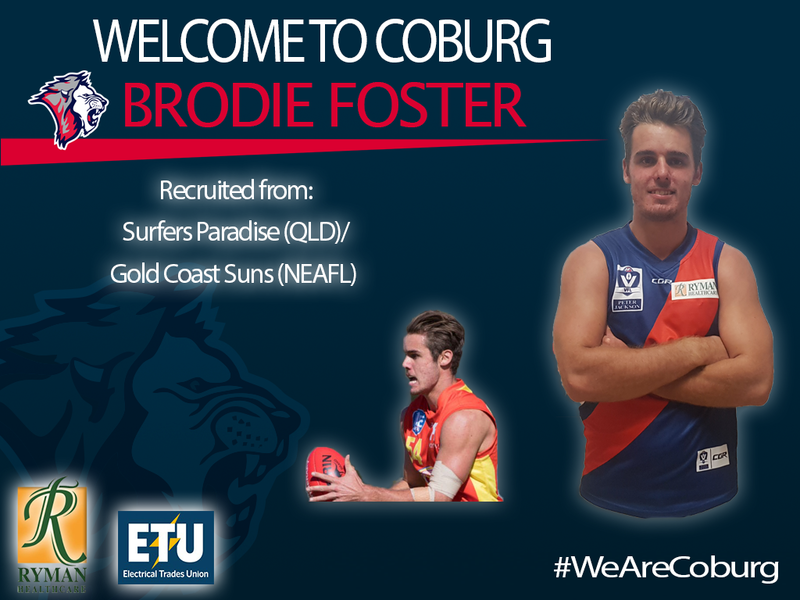 Coburg are delighted to announce the signing of Queenslander Brodie Foster. Originally from AFL Queensland Club Surfers Paradise where he progressed through their Juniors, Foster was selected to become a member of the Gold Coast Academy where he then spent five seasons. In 2018, Foster played for the Suns in the NEAFL competition, managing 18 games for three goals. Foster averaged 20.5 disposals per game, mainly playing in the midfield and across halfback. His efforts also earned him a NEAFL Rising Star nomination throughout the season. Foster has an outstanding ball winning ability and represented the Allies at Under 18 Level in the 2017 National Carnival. Foster comes with high credentials and recommendations, and is looking forward to making the permanent move to Melbourne in the new year having signed a two year deal with the club. “I’m looking forward to the experience of playing against AFL listed players, it’s a pretty big step up so I’m pretty keen to get around that with the boys,” said Foster. GM Sebastian Spagnuolo was thrilled with securing the services of the former Gold Coast Suns Academy Member. “He’s a ripping character & very committed to his football, which is evident by the fact he’s moving his life down to Melbourne to pursue his dream to get drafted, which we know he wasn’t far off from achieving. His ball winning ability is his major strength and we’re sure that he’ll complement our midfield very well” Spagnuolo said. Join Brodie as a Lion next season, be sure to click here and sign up as a 2019 member today! Stay tuned for more news throughout the off-season by subscribing to The Roar HERE, where you can get all the Exclusive News, and up to date information ahead of the 2019 season. PODHAJSKI COMMITS TO COBURG WHILE LOOKING TO DEVELOP AS A MIDFIELDER! Brent Taylor comes on board as an Assistant Coach for 2019.